BBQ is food for the Soul. I don't know what it is; but there's something very primal about bbq...something very relaxing about the 'aroma and taste' of smoked meats. Maybe the smell of smoke brings back memories of the family picnic, a warm summer day, a favorite meal or place. Something that tells your brain: relax and be happy! It's good for the soul. Food for the soul. Bet you are feeling better already! Whether I'm consulting, training new customers, or just talking with friends; when you start talking about bbq, everyone has a favorite story to tell and a family recipe to share. There's always a smile on the storyteller's face. BBQ invokes PASSION....in just about everyone. The smell of meats slow smoking with hickory, leaves a footprint on the brain. Seriously, who can't look at this picture of ribs and not say "Ahhhh?" [Well, maybe not if you are a vegetarian. But for you; I can smoke some awesome corn on the cob, smoked veggies; even tofu!] When I look at pictures like this; for some reason, I feel relaxed; like "no worries, mahn." Very strange, I know. How many foods can you think of that leave that type of impression? And even though a picture can paint a 1,000 words; tasting that scrumptious flavor will create an even deeper impression. One that makes you want more. Want to be the memory maker in your community? Let us, show you 'the way.' Contact us. Next time: What's new with Broaster Chicken! Chad and Lynn - Southern Pride training day. I had the privilege of working with Celebrity Chef, Chad Rosenthal recently and all I can say is, "What a super guy." 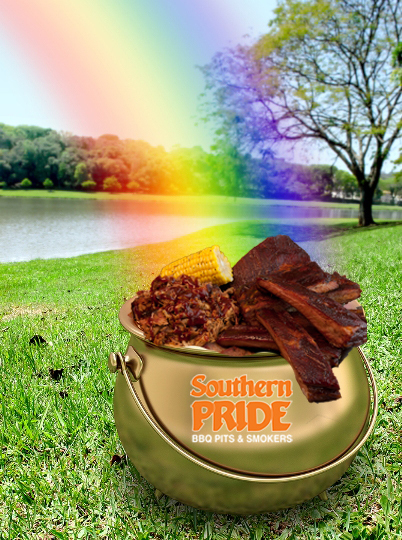 He purchased a Southern Pride Smoker from me for his new restaurant. This model will easily hold over 750 lbs. of meat. [That's some serious cooking.] And Chad is loving it! Perfect every time! You can tell that Chad is very passionate about what he does. His attention to detail throughout the restaurant from decor, to menu development, to plate presentation, coupled with his true love of bbq, is meant to give diners a very memorable dining experience. Chad's even developed his own signature beer, fresh on tap! This is the "WOW" factor that I talk about on our Home Page. It may sound corny; but it truly separates you from your competition...and it's important to your customers. 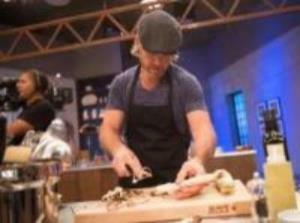 During the process of working on his new restaurant, he was also completing a season on Food Network Star. So now with all of that completed, he can channel all of his creativity and focus into The Lucky Well. You can also follow him on Twitter and Facebook as well. See Chad in action with a few names you might recognize.. Thanks Chad, we wish you all the best! Keep checking my blog for the next featured restaurant. It just might be you!